When MSC occupied the 4th floor of the La Suerte building, there needed to be another venue to accommodate the “overflow” students from MSC Main (as what the students used to call MSC – La Suerte). 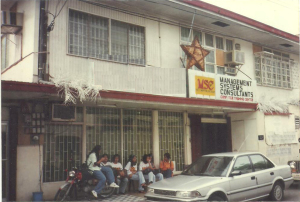 What MSC found was the old building along Artemio Fule St. (upper Lopez Jaena) which used to be Agrix Supermarket. This new site was christened MSC Annex or simply Annex. By then everybody knew that MSC was already offering a course for Computer Technicians. Student technicians were trained to open up the computer’s housing, poke around the motherboard and shake their heads knowingly while making tsk, tsk… sounds. For these guys, the Service Center served as the laboratory for hands-on training. Annex had a workshop, and repair jobs from outside accepted here, where MSC technicians looked through them (replace parts if necessary). MSC Annex was a fun place to work in! This entry was posted in MSC and tagged A. Fule St., Agrix Supermarket, Arturo Fule St., Autocad, computer technicians course, MSC Annex, MSC La Suerte, MSC Main, Service Center on November 18, 2014 by Jose Adonis Duma.